Make the most of your stay by comparing Hannibal Garden House with other lodging options. And see what you can expect when you stay with us. Following are the answers to many frequently asked questions (FAQ's) with space to fill in your other options. You can print this page to complete at your leisure. We welcome any other questions you may have, and of course, we welcome your reservation! Simply contact Chris at 573.221.7800 or email us. Our cancellation policy noted below and also sent with your confirmation e-mail of reservation. Does the House have seasonal river views? Yes. And are they gorgeous! On what floor are the Rooms? All on 2nd and very private! Are you within walking distance to Main Street shopping? Three simple blocks which pass through the gorgeous Historic Central Park District! room units) or none? Central air fills the House, even on the warmest of Hannibal days! How about TV's, DVD and VCR players! You bet...and DVD's, VHS tapes (over 300 movies), local TV in all bedrooms! Is the Bistro inspected by Health Department? We'd have it no other way! the same building? Yes, and we're the innkeepers, 24/7! Is there off street parking? No, however there is plenty of street parking...we are on a corner lot...and no permits are required! allowed? With advance notice; please call for details! Are alarm clocks available, so I can wake up for my fully prepared breakfast? In every room, if you really want to use it...but we suggest using the CD player attached to it! Is any smoking allowed? The entire House and Gardens are smoke free! What time is breakfast? 8:30AM is ideal. Stores open around 10AM. if needed? Of course, go out and have a full, fun day! You have to see the Dining Room to believe it--it's one of a kind...just like you! Are children allowed? Well behaved children a pleasure! Infants not compatible. What about telephones? Everyone has cell phones! How about Wireless High Speed Internet Access? We have wireless internet WiFi. And it's fast and free! We LOVE your bathrobes and feather beds! Are they for sale? Of course! We have lots of great items like original local art but not our recipes. Sorry, family secrets! Shop online on this site! What other services do you provide? Here's a few: Special Innkeeper, Ghost Tours, picnic lunches, ideas for daytrips, self-guided historic home walking tours, extra blankets and pillows,...and more! · Incense, candles, open flame is prohibited. · Your credit card is charged the totat cost at time of reservation, pending prices and room availability are not guaranteed until full payment is received. If CASH is to be final payment, please note in "special needs" area of reservation request document. · Check-in time is 3-4 pm with late arrivals by advance arrangement only. Earlier check-in or later may be available, depending on housekeeping and schedule, call ahead! ALWAYS PHONE AHEAD, ONE HOUR, BEFORE ARRIVAL TO 573-221-7800 so we can anticipate meeting you! Cancellations or ANY changes in existing confirmed reservation will be charged a $35 administration fee, per night and per room of reservation. Reservation is guaranteed for arrival on the confirmed check-in date only, normal check in hours or prearranged times in advance.. If you don't check in on the first day of your reservation and you do not alert the Garden House in advance (at least 24 hrs of arrival date), the remaining portion of your reservation will be cancelled and you will not be entitiled to a refund. All rooms are guaranteed for double occupancy and accommodations for more than the specfied number are not guaranteed. Reservation holder must be 21 years of age or older. Cancellations made less seven (7) days of arrival date, no refund will be given, the entire cost of the reservation will be charged to the credit card the reservation is held on, if it has not been already paid in full. 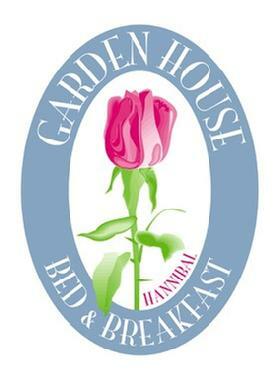 We are a small, owner owned and operated B&B, every reservation counts! By receiving your email confirmation letter, you agree to abide by the above policy. CANCELLATIONS ARE NOT ACCEPTED VIA E-MAIL, REGULAR MAIL OR VOICE MAIL Only calls made personally to the Innkeepers will be recognized for cancellation, 573-221-7800. It's easy to find us, simply check out Google Maps.